The South Sydney Rabbitohs will need everything to go right as they fight for the minor premiership, but it’ll be a tough task when they travel north to play the desperate Brisbane Broncos. Join The Roar for live scores and coverage from 7:50pm (AEST). The Rabbitohs come into this game understrength, with backline injuries leaving them without Alex Johnston and Greg Inglis, who continues his recovery. Dane Gagai will make the move to fullback, with the experienced utility back needing to slot straight in and spark the South Sydney outfit alongside Adam Reynolds and Cody Walker in the halves if they are to overcome Brisbane. Yet, it hasn’t been the halves and spine leading the way for Souths this year. 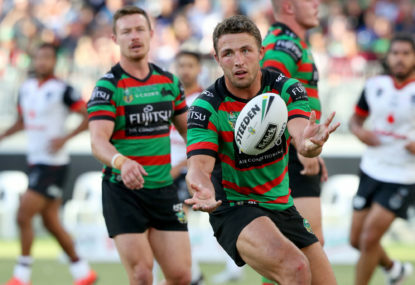 It’s been their forward pack, let by the Burgess brothers who have laid the platform for Damien Cook to roll out of dummy half and ensure their attack has been firey. Combine it with a strong defensive effort and will not to concede points, it’s little surprise they have won 11 of their last 13, although a loss to the Roosters last week may put a spanner in the works. They didn’t have 17 players for the duration of that game though and while their form isn’t quite at the level it was when they won nine straight, it’s not far away. The biggest thing the Broncos appear to have going for them is their record over the Rabbitohs, which has seen them win all of the last five and 27 of 37 in total. The pressure is starting to build on Wayne Bennett’s men. While the off-field coaching rumours continue to circulate, the Broncos have lost two matches on the hop against bottom four sides the Bulldogs and Cowboys. While it’s hard to take a great deal from the Queensland derby given ladder position never seems to matter, the loss the previous week to the Bulldogs was a major concern. Their issues in defence and in creating enough points across the park reared their head again and if the Broncos are to win tonight, they need their forwards to match it with the Rabbitohs, to control the ruck and hope Anthony Milford and Kodi Nikorima pull something out of the bag for 80 minutes in the halves. Brisbane have the record and the home ground, but their form is somewhat unpredictable and given Souths game has been based on a dominant forward pack, not having their backline shouldn’t bother them too much. Be sure to join The Roar for live coverage of the Round 23 opener from 7:50pm (AEST) and don’t forget to add a comment in the section below.